The psychology department at Oklahoma State University has finally answered a question that has plagued mankind since the dawn of time: What happens when bees get drunk? BACKGROUND: The purpose of this experiment was to test the feasibility of creating an animal model of ethanol consumption using social insects. Honey bees were selected as the model social insect because much is known about their natural history, physiology, genetics, and behavior. They are also inexpensive to procure and maintain. Of special interest is their use of communication and social organization. METHODS: Using both between- and within-experiment designs, studies were conducted with harnessed foragers to determine whether honey bees would consume ethanol mixed with sucrose (and, in some cases, water). Shuttle-box and running-wheel studies were conducted to examine the effect of ethanol on locomotion. The effect of ethanol on stinging behavior in harnessed foragers was investigated. The effect of ethanol on Pavlovian conditioning of proboscis extension was also investigated. Finally, in a self-administration study, foraging honey bees were trained to fly to an artificial flower containing ethanol. RESULTS: (1) Harnessed honey bees readily consume 1%, 5%, 10%, and 20% ethanol solutions; (2) 95% ethanol will also be consumed as long as the antennae do not make contact with the solution; (3) with the exception of 95% ethanol, consumption as measured by contact time or amount consumed does not differ in animals that consume 1%, 5%, 10%, and 20% ethanol solutions; (4) exposure to a lesser (or greater) concentration of ethanol does not influence consumption of a greater (or lesser) concentration; (5) consumption of 10% and 20% ethanol solutions decreases locomotion when tested in both a shuttle-box and running-wheel situation; (6) consumption of 1%, 5%, 10%, and 20% ethanol does not influence stinging behavior in harnessed foragers; (7) ethanol solutions greater than 5% significantly impair Pavlovian conditioning of proboscis extension; and (8) free-flying honey bee foragers will readily drink from an artificial flower containing 5% ethanol. CONCLUSIONS: The experiments on consumption, locomotion, and learning suggest that exposure to ethanol influences behavior of honey bees similar to that observed in experiments with analogous vertebrates. The honey bee model presents unique research opportunities regarding the influence of ethanol in the areas of language, social interaction, development, and learning. Although the behavioral results are interesting, similarity between the physiologic effects of ethanol on honey bees and vertebrates has not yet been determined. That's right, the official "Got Hives?" T-shirts are now in stock! Finally - I've Got Hives! 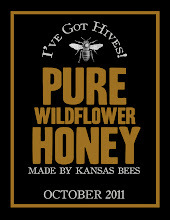 100% pure wildflower honey is now available. 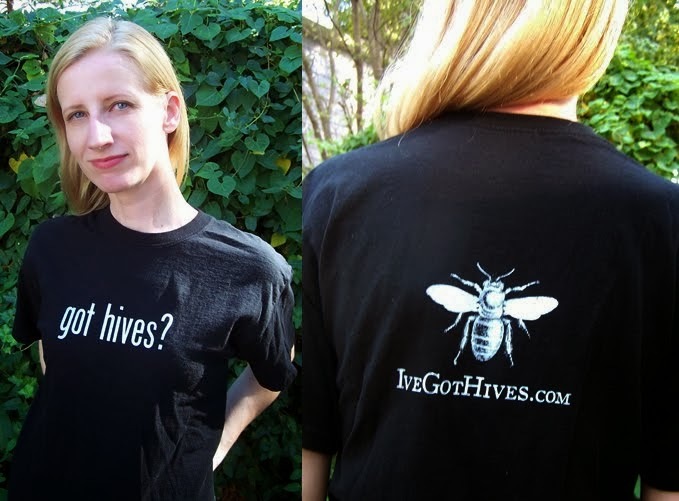 Email: Jay@IveGotHives.com Facebook: I've Got Hives!